For the first time in its history, the Mobile World Congress in Barcelona welcomed over 100,000 visitors, most of them in suits. We visit quite a few shows and one of the things that stands out is how well it is run. Whether you’re at the airport, subway, or the registration desk, there’s show staff right there holding signs and letting you know where to go. Even though the show grew quite a bit again compared to last year, lines were shorter and seats were easier to find at the many food stands and coffee shops. The mobile industry remains huge with more than 1.5B smartphones sold each year. On top of that, smartphones bring significant revenue to the operators, infrastructure equipment makers, and the apps developers. Mobile phone market leaders can even afford to make their own semiconductor devices: applications processors that function as the beating heart of these devices. 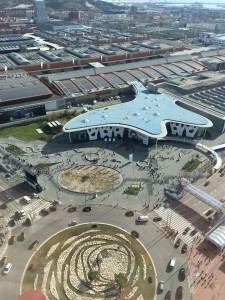 The Mobile World Congress brings this whole community together. It’s what attracts CEOs of ARM, Facebook, Intel, Huawei, Samsung, and Qualcomm to present keynotes at the event. Phone companies use the venue to introduce their latest smartphones. This year LG, Samsung, ZTE, Xiaomi, and Sony decided to launch their new phones in Barcelona. Virtual and augmented reality have been around for some time, but the momentum is now really building. Several new immersive displays were announced at the show. The simplest perhaps was Alcatel’s. Their new Idol 4 smartphone comes in a box that can be repurposed as a VR headset. LG announced their LG 360 VR Headset. Epson announced their Moverio BT 300. HTC unveiled the final version of the top-spec Vive VR system, at $799 the highest-end consumer VR system announced at the show. The biggest announcement was Samsung’s $99 Gear VR, with Facebook showing their backing by supporting 360 videos on the device. Another trend are multi-sensor cameras. The next iPhone has been rumoured to include a dual rear camera for some time, and HTC did it before. Now, LG includes a dual camera in their new phone. Smartphone cameras are rapidly introducing more computational photography techniques, and dual sensors are just a first small step toward what we’re likely to see in the future. Besides using a dual camera to capture higher quality picture with depth or special focus effects, 360 cameras capture the full surroundings of a device. Again, it was LG and Samsung taking the honors of introducing new devices that capture surround video. LG anounced the LG 360 Cam and Samsung the Gear 360. In addition, Sony announced a wearable camera. Capturing more video, whether it’s with always-on techniques like Sony’s or by using wide-angle lenses like LG’s and Samsung’s is another key trend from the show. Caterpillar had an interesting announcement: they launched a new smartphone with a FLIR thermal camera built in. With the ability to see in total darkness and visualize heat that is invisible to the naked eye, the phone’s camera measures surface temperature from a distance. Potential applications are to detect heat loss around doors and windows, spot moisture or missing insulation. We’re looking forward to seeing more phones with interesting sensors: multispectral, radar, depth sensors, Lidar, a lot is possible. In summary, just like we wrote in our CES show report, imaging is a big topic again. Whether it’s about using new types of sensors, capturing data with new technologies, manupulating picture and video in new ways, or having electronics understand the images they’re capturing, all require high-performance, low-power processing solutions. We’re excited to provide such a solution to the market and in working with our customers to bring these new applications and possibilities to consumers.